We offer a variety of plates, bowls, and trays, to add to the esthetic feel as well as being a great eco-alternative for all your food serving needs. This disposable dinnerware will not only help reduce the ecological footprint of any event, but also draw attention since they’re visibly so green. Our dinnerware doesn’t let the hosts ‘greening’ efforts go un-noticed. 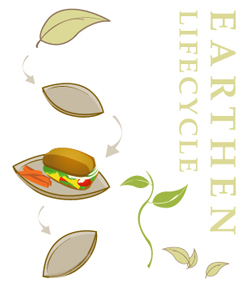 Earthen provides 100% Eco-Friendly Cutlery, Eco Friendly Dinnerware, Palm Leaf Plates, Composite Plates, Biodegradable Dinnerware, Eco Friendly Product which are naturally, chemical-free and biodegradable just like any other leaf fallen from a tree with numerous valuable environmental benefits. EARTHEN dinnerware comes from a simple concept derived in rural India where villagers used materials abundantly available in nature for use in their households. One such material was the dried leaf sheath of the Areca palm tree. This hard, yet pliable material is used to make Earthens. To learn about the benefits click WHY EARTHEN. • Compostable – Ideally should be composted in commercial or backyard programs, and can also be used as garden mulch to nourish soil. • Biodegradable – Naturally biodegradable fallen leaves, that will decompose in landfills, if they make it there! • Natural n’ Organic – No chemicals, polish, bleach, or GMO’s. • Hygienic – Sterilized by using high heat and water. • Good with hot food and liquids – Does not leak and is very comfortable to hold in the palm of your hand. • Hard n’ Sturdy – Almost like a thin sheet of wood that you could knock on, raised edges make them convenient to hold without worrying about spilling. • Unique Designs by Mother Nature – Chic and modern looking, each piece is beautiful and unique with its own identity.